Contrary to the above photo, Reeds Lake in East Grand Rapids is bustling with activity on a Saturday morning. It’s a different sort of community. The streets are filled with morning joggers. Two girls drop off their kayaks for a morning cruise along the shore. Rosie’s Diner, to the left, has a series of docks jutting out holding all manner of ski and pontoon boats. Two ladies sit in a pontoon boat, no need to fire it up, they just sit and drink coffee and enjoy the lake. I watched a guy catch a ten inch perch standing on the boat launch dock. I made plans to meet Mike at 9:00 AM and standing there, soaking it in, wished I would have said 8:00 or maybe 7:00. The lake is calm. I came to fish. Mike was right on time. I used the trolling motor to move us over to the drop off along Rosie’s docks. I tossed plastic worms and Mike tossed soft plastic minnows. The water was a bit muddy and I wasn’t sure the fish would see the worms. Mike picked up a small bass and then lost another right at the boat. Jigging the flashy minnows was a pattern. 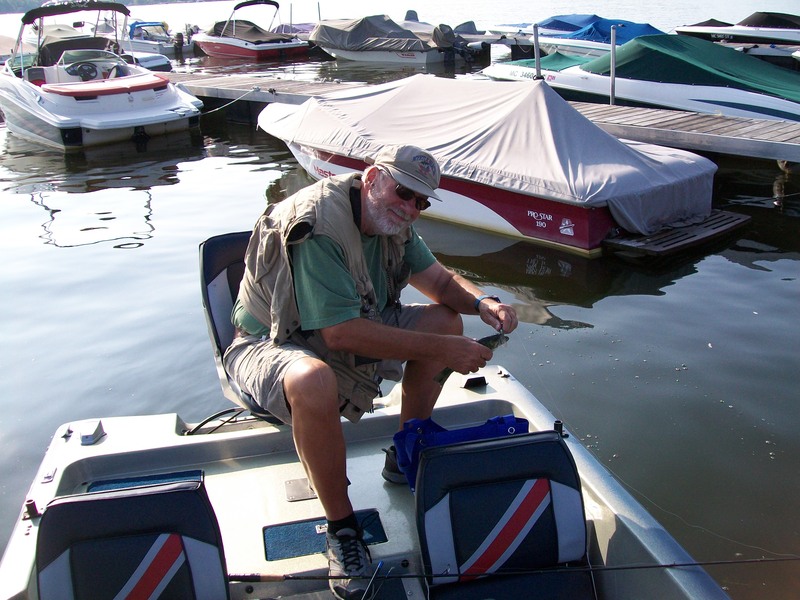 Mike commented on all the baitfish he was seeing, some following his lure. That’s a good sign the lake is healthy. We eased out on some some shallow flats and I tossed a top water, a Rebel POP-R, and caught a small bass, appreciating the fact I finally caught something because I was beginning to wonder. I get a little to caught up in the fishing sometimes, like it’s very important to be productive. After a bit we started talking about life, movies, politics, and also a blog Mike’s been thinking about writing. Kind of an advice for intelligent living blog centered on treating others like you would like to be treated, that sort of thing, and no doubt he has some interesting things to say. He spent most of his working life as a divorce attorney and has seen the worst of behavior and what it does for people. So some sage advice from one who knows might make an interesting blog. Suddenly the sun was like a spotlight so I put on some sunscreen and fired up the boat motor, a 90 HP Nissan, and took a short flight to the other end of the lake to cool down. I needed to burn the carbon off the spark plugs. That’s my excuse. Actually, it might be a need for speed. The sixteen foot Nissan bass boat really cranks and it’s fun to drive. Had it up to about 50MPH, which is literally flying when you hit the wakes from other boats. After picking up my tackle box which went end over end we motored slowly along the shoreline and admired the beautiful homes on the lake. Estates might be a better word. Some people do pretty darn well. 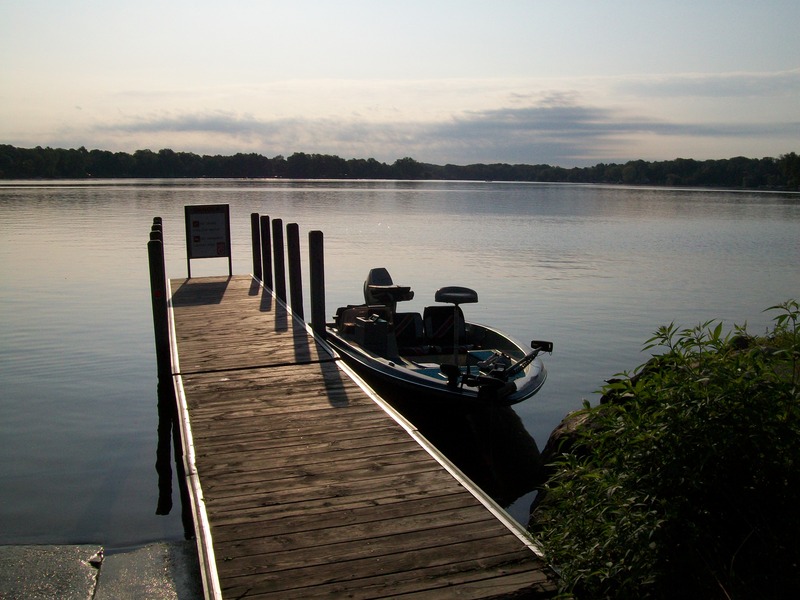 Reeds lake is a great fishery filled with bass, pike, perch, and panfish. My only complaint might be the boat launch which forces you to back up on a busy street. The park committee could have put a turnaround at the launch and saved fishermen a lot of hassle. You need to park your vehicle and trailer on the street but there’s lots of parking. So it was a great Saturday morning with a few bass, interesting conversation, and a nice boat ride. Thanks Mike! Coming soon – more trout stories!